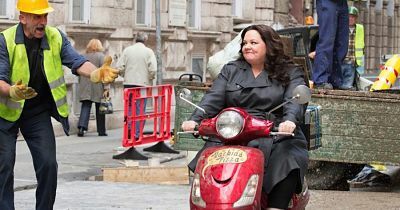 Melissa McCarthy (St. Vincent) embarks on a top-secret mission as a secret agent in the action comedy Spy, directed by Paul Feig (Bridesmaids). In the film, deskbound CIA analyst Susan Cooper (McCarthy) is about to become the world’s newest — and unlikeliest — secret weapon. When her partner (Jude Law, Black Sea) falls off the grid and another top agent (Jason Statham, Parker) is compromised, Susan volunteers to go deep undercover and bring down a deadly arms dealer…and the entire international intelligence community! The film, which also stars Rose Byrne (X-Men: First Class), Allison Janney (The Way, Way Back), Bobby Cannavale (Danny Collins), and 50 Cent (Escape Plan), was well-received at the domestic box office when it was released theatrically earlier this summer, grossing over $100 million. Further, the movie was adored by critics, who gave it a dazzling 95% fresh rating on RottenTomatoes.com. The Blu-ray release will include two versions of the film – Theatrical and never-before-seen Unrated Cut. The DVD will feature the Theatrical version. Both the Theatrical version and Unrated Cut of Spy will also be available on Digital HD on September 4.